00:20:00 Makes 4 servings, 1/4 recipe (106 g) each. Makes 4 servings, 1/4 recipe (106 g) each. Heat oil in wok on high heat. Add ginger; stir-fry 5 sec. Add shrimp; stir-fry 3 min. Stir in wine; cook 15 sec. Add water and sugar; cook and stir 1 min. Add barbecue sauce; stir. Bring to boil; simmer on medium heat 2 to 3 min. or until shrimp are done. Sprinkle with chives. Serve with stir-fried vegetables and hot steamed brown rice. 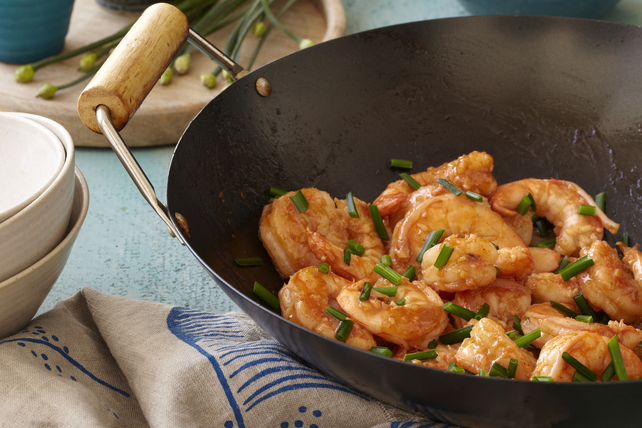 This quick and easy shrimp recipe can be part of a healthful eating plan. Serving Size Makes 4 servings, 1/4 recipe (106 g) each.